Here’s the thing about Easy Reader chapter books. Everyone uses a different term for these kinds of books, so it’s hard to know exactly what to include and what doesn’t fit within the parameters. 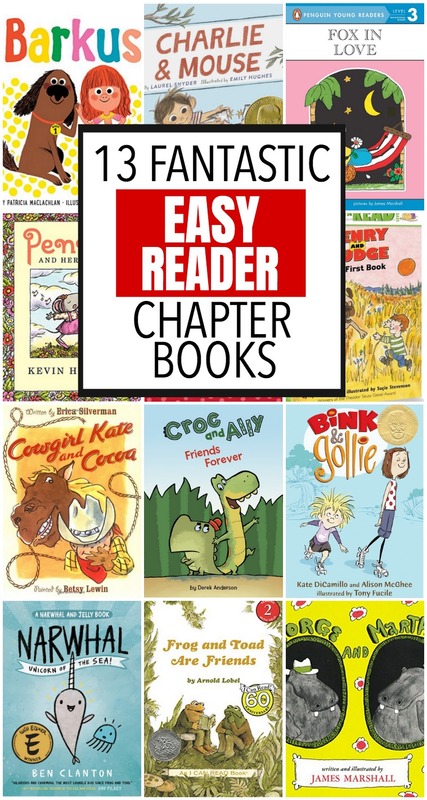 So for our purposes and this list, know that when I use the term “easy reader chapter books” I’m talking about the kinds of books that are basically a long picture book, broken up into 3-5 short chapters. You can read the whole thing in 10-15 minutes. I’m NOT counting longer chapter books like Mercy Watson or The Princess in Black (I’ll be posting a list of my favorites of those kinds of books in a few weeks). 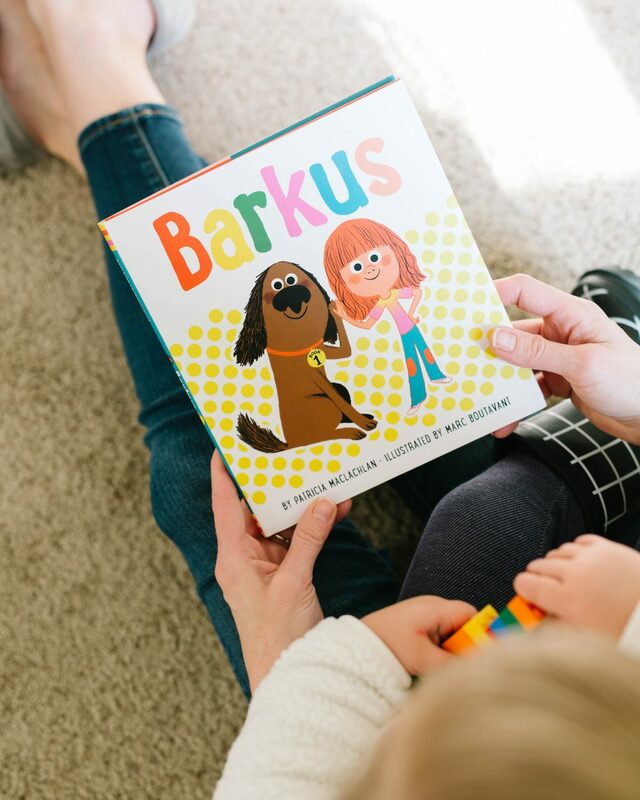 Easy Reader chapter books are perfect for children who are developing a longer attention span and can handle something slightly longer than a typical picture book. They’re also great for beginning readers who want to read something with chapters, but might not be ready for a longer chapter book yet. These thirteen are among my very favorite easy reader chapter books – I hope you’ll love them too! To me, this is the classic easy reader chapter book series. We have several of them on Audible and Star listens to them almost daily during quiet time. The stories are so clever and fun, even for adults. This is a fairly new easy reader chapter book series and I absolutely LOVE it (there are currently three in the series). It follows two young brothers who have the sweetest relationship and have all sorts of little adventures, from selling rocks to inventing a bedtime banana (as one does). I grew up with this series and I still love it just as much today. This sweet pig family has every sort of adventure you can imagine, from first days of school to grandmother coming to visit. I own every holiday one and I never get tired of them. The illustrations are perfect and the stories are gentle and also amusing. I mean, it’s hard to go wrong with Kevin Henkes and he delivers in this easy reader chapter book series with three sweet books about a little mouse, Penny, who gets a new doll, finds a marble in the grass, and invents a new song. I’m pretty sure we’ve read every one of them at least 100 times. All of my girls have been OBSESSED with them. Barkus is a big dog, given to Nicky by his favorite uncle (let me tell you, an uncle that gave us a giant dog would NOT get” favorite” status in my book). The bright illustrations and madcap adventures make this a very fun new series. If there was ever a book that could make me laugh, it’s a George and Martha book. These two hippo friends are hilarious and their stories and (mis)adventures make me chuckle out loud. Narwhal and Jelly don’t have much in common but they do both LOVE waffles and they’re always up for an adventure together as the explore the ocean. This easy reader chapter book series leans more toward graphic novel format, so they’re a nice option for young readers who gravitate toward those. These remind me strongly of Frog & Toad. They have the same personality juxtaposition – one upbeat and one kind of blue – and the stories are just silly and fun. They aren’t nearly as long as Frog & Toad, though, so if you want a book you can read in a few minutes rather than 20, this series is for you. I’m always drawn to illustrations by James Marshall (I’ve loved him ever since Miss Nelson is Missing) and these easy reader chapter books are goofy and high-spirited, with Fox always getting into mischief despite his best efforts. This is another series that we own on Audible and listen to on repeat. These funny stories about a young cowgirl and her horse are delightful, full of gentle humor, and just all around fun. We often check paper copies out from the library so Star can follow along with the pictures as she listens. I love these books about identical twins who look exactly the same but very different in many ways. From making birthday cakes to how they spend their free time, they are both true individuals. This three book series (from the author of Mercy Watson) just delights me to the CORE. Bink and Gollie are two young girls who head out on three hilarious adventures in each book. They’re just bursting with the irrepressible joy of childhood and friendship. If you haven’t read these, you’re missing out. Aside from Frog & Toad, this is the classic easy reader chapter book series in my opinion. There are SO MANY of them, and the adventures of this young boy and his massive somewhat-ill-behaved dog never get old. Any other favorites I’ve missed? Let me know! These are so great! I just shared a similar list; a few of the same and some different ones! Definitely going to add a link back to this post for my readers to get more of your great recs. Thanks for sharing. My daughter just turned the corner into reading fluency and it is so fun! She’s almost 5 and we are tearing our way through the easy reader section at the library. She also loves the Penny books and Cowgirl Kate. One author/series we discovered this year is Corey R. Tabor’s Fox series. They’re not chapter books but they do make me laugh out loud. Fox thinks he’s a tiger, goes too fast on his skate board, and has a jumping contest with his animal friends. We love them all! 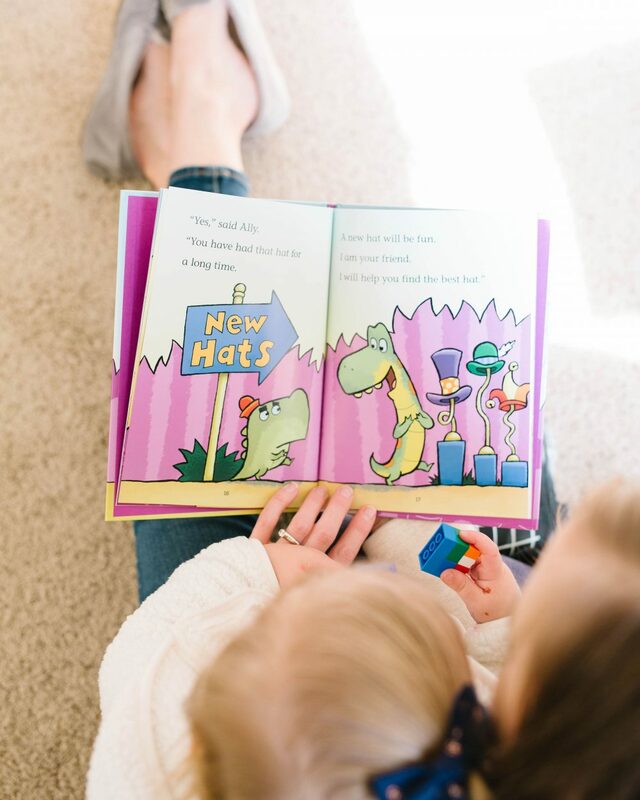 Have you read Amanda and Her Alligator by Mo Willems? It’s one of my favorites! I just wrote a similar post the other day! Any of these could’ve gone on my list too because my kids LOVE all of these. I bought George and Martha to try and push on them because I loved it as a child! Ha! And my daughter rereads her Narwhal and Jelly books every.single.night! Frog and Toad is another regular read around here- and I love Bink and Gollie! We JUST read two Croc & Ally books this week! I think my son liked them. And we’ve read the first two Charlie & Mouse, didn’t know there was a third! My older son is 6 and we finally started chapter books this year but I like these shorter ones mixed in with picture books too. Thanks for a great list!